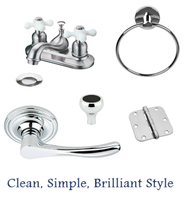 We provided chrome hardware for 5 houses last week. That's almost as many as we did all of last year. Maybe not, but we're getting a ton of requests for polished chrome door knobs and US26 finish hinges these days. Oil rubbed bronze and satin nickles finishes have reined supreme in homes, for about the past 10 years. Earlier today I wondered why more and more people seem to be drawn to the shiny chrome finish. I thought maybe it's because polished chrome is like the little black number in every well dressed woman's enormous walk-in closet. I know my eyes are drawn to the sheen of chrome door hardware as soon as I enter any room. Maybe it's not like the dress, then. Maybe your home is th e dress and chrome is like the diamond necklace that adds a touch of class to the dress. Let's go with that one. Chrome finishes just seem to enhance a room no matter the decor. Or how 'bout chrome cabinet hardware reflects like the perfect trim on a vintage European roadster. Sure, its about the cabinets and what's inside. But, it's the attention to detail that makes cars and kitchens alike, stand out. Updating cabinets with chrome knobs and pulls is one of the easiest and most cost effective ways to dramatically change the look of a room.
. Most of all though, for me at least, the classic and familiar shine of a chrome kitchen faucet is like the ketchup from my 1980's middle American childhood. It makes everything better and doesn't cost a lot. Chrome is one of the more economical finishes. Polished chrome door levers and bathroom fixtures fit quite nicely into almost any budget and positively every single style of home interior design there is. I looked it up. » Here We Chrome Again!